MEAB believes in exceeding expectations. This belief has won MEAB several awards in the financial services industry. These awards represent international recognition that MEAB's growth strategy, capitalization and customer appeal have been unmatched in Lebanon. On September 11, 2015, MEAB was named “Best Retail Bank, Lebanon” by World Finance Magazine. According to the magazine, the award recognizes MEAB for its excellent customer care, easy-to-use internet banking platform, competitive interest rates and its high level of compliance with international standards. The 2015 World Finance Banking Awards has honored the very best of global banking each year since 2007, celebrating achievement, innovation and brilliance throughout the industry. Award recipients are chosen by an expert judging panel and informed by a research team, the magazine’s 230 years of financial and business journalistic experience and the insight of the World Finance readership. In 2012, World Finance also awarded MEAB the title of “Best Private Bank in Lebanon,” recognizing the bank’s leadership in the Lebanese market. Read World Finance’s recent interview with Chairman Ali Hejeij on Lebanon’s banking sector here. To view the complete list of award winners, click here. 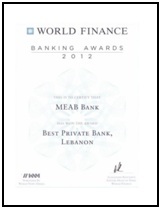 On July 13, 2012, MEAB was named “Best Private Bank in Lebanon” by World Finance Magazine. MEAB Chairman Kassem M. Hejeij accepted the award at a ceremony at the London Stock Exchange. "I am honored to receive this prestigious award on behalf of MEAB's clients, partners and correspondents," Chairman Hejeij said. "The award recognizes MEAB Bank's leadership in the Lebanese market and validates our plans to expand internationally. MEAB's highly professional managers are proud to provide our customers with a stable, transparent and meticulously law-abiding financial institution. We are also grateful to World Finance for this honor." The Banking Awards, which were established in 2007, celebrate achievement, innovation and brilliance in the world of finance. Recipients are chosen by independent experts who are informed by the magazine's 230 years of journalistic experience and the opinions of its readers. To view the complete list of award winners click here. To read World Finance Magazine’s profile about MEAB, click here. 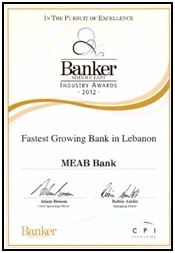 On June 12, 2013, MEAB was designated “Fasting Growing Bank in Lebanon” by CPI Financial. MEAB Chairman Kassem M. Hejeij accepted the award during the 13th annual Banker Middle East Industry Awards ceremony in Dubai. The Banker Middle East Industry Awards is the region’s leading financial event. Recipients are chosen by the readers of Banker Middle East, Islamic Business & Finance, FinanceME, WEALTH Arabia, and CPI Financial magazines.